Lord Herbert of Chirbury who raised the regiment in 1689 and served as the first Colonel of the Regiment. Sir William Howe was a former Colonel of the Royal Welch Fusiliers. As Commander of His Majesties Forces in North America during the American Revolution, Howe served from the Battle of Bunker Hill until just before the British evacuation of Philadelphia in 1778. During the Crimean War at the Battle of the Alma on 20th September1854, Sergeant Luke O’Connor, although seriously wounded with a musket ball in the chest, won the Regiment’s first Victoria Cross by carrying forward the Regimental Colours. He later became a Major General and Colonel of the Regiment. Lieutenant Frederick Mackenzie served with the Royal Welsh Fusiliers at Lexington and Concord and left one of the more valuable and unbiased accounts of that engagement. He later went on to serve as an aide to General Sir Henry Clinton. Captain Thomas Saumarez of the Royal Welsh Fusiliers from a miniature circa 1783. The uniform worn is an example from the waning years of the American Revolution, and Saumarez’s diary of his service has become an important source for scholars of the American Revolution. Poet and author Siegfried Sassoon won the nickname “Mad Jack” for his bravery and almost complete disregard for his own safety in conducting trench raids while serving with the 2nd Battalion of the Royal Welch Fusiliers during the First World War. His exploits won him the Military Medal and he was wounded severely twice . Robert Graves served with Siegfried Sassoon in the 2nd Battalion of the Royal Welch Fusiliers during the First World War. He later wrote the famous memoir of his experiences “Goodbye to All That,” Among his more notable works were “I, Claudius”, “Sergeant Lamb’s America”, and “Proceed Sergeant Lamb” the later two being novels based on the diary of Sergeant Roger Lamb. (see below) Interestingly Graves’ works were first published in the United States by The Hudson Review, a literary quarterly founded and edited by Frederick Morgan, father of Gentleman Volunteer Jeff Morgan of the Colonel’s Company, Royal Welch Fusiliers in America. Sergeant Roger Lamb (no picture available) left one of the most interesting accounts of the American Revolution written from either side. Originally in the 9th Regiment of Foot, Lamb took part in Burgoyne’s invasion from Canada which ended with the British surrender at Saratoga. Placed in captivity with the “Convention army,” Lamb eventually escaped to New York City where he joined the Royal Welch Fusiliers as a sergeant, taking part in the Southern campaign that culminated with the surrender at Yorktown. His memoirs, “Original and Authentic Journal of Occurances During the Late American War” was published in Dublin Ireland in 1809. Private Frank Richards served in both the 1st and 2nd Battalions during the First World War and is one of only five men to have survived the entire war from 1914 until 1918. His memoir, “Old Soldiers Never Die” is still considered today as one of the best accounts of daily life in the trenches from the perspective of a “ranker.” Richards also published “Old Soldier Sahib” a memoir of the Royal Welch Fusiliers’ service in India prior to the First World War. He was awarded the Dinstinguished Conduct Medal and the Military Medal for his service during the war. Although technically Captain James Churchill Dunn DSO, MC (and Bar) DCM was a member of the Royal Army Medical Corps, he served with the Royal Welch Fusiliers for three years as Medical Officer during the First World War and left an amazingly detailed informal history of the regiment’s service in that conflict. His “The War The Infantry Knew 1914 – 1919” has been hailed as an epic account of trench warfare by historian John Keegan. Dunn, who was known to have ignored his medical non combatant status and gone over the top on several raids as a fighter, originally published anonymously, although his contemporaries Graves and Sassoon later confirmed the good doctor’s identity. 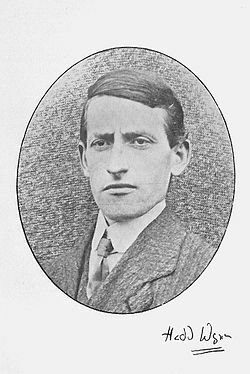 Hedd Wyn (1887-1917), born Ellis Humphrey Evans , Son of Evan and Mary Evans, of Trawsfynydd, Merioneth was a sheep farmer turned poet-soldier who was killed during the First World War. Evans – who chose Hedd Wyn (‘white peace’) as his pen name – was born in Penlan, Trawsfynydd the eldest of eleven children, and lived for much of his life at Yr Ysgwrn, a hill farm east of Trawsfynydd. He began writing Welsh-language poetry at an early age; when aged 24 he was awarded a chair at Bala; others followed at Llanuwchllyn, Pwllheli and Pontardawe (the latter in 1915 with the First World War underway). Wynn sat out the war for three years as a sheep farmer until he was called up for military service in 1917. Following a spell of training in Liverpool Private Evans was despatched for active service in Flanders and found himself stationed with 15th Bn Royal Welsh Fusiliers at the notorious Pilckem Ridge immediately prior to the opening of the Passchendaele offensive (3rd Ypres). It was at Pilckem Ridge that Wyn was killed during fighting on 31 July 1917 . Buried initially on the battlefield (out of necessity) his body was subsequently moved to Artillery Wood cemetery following the armistice. September that year brought a posthumous award of the chair at the National Eisteddfod of Wales for his verse poem Yr Arwr (‘The Hero’). Wyn had written the poem while serving in Flanders and completed it shortly before his death under the nom-de-plume of ‘fleur-de-lis’. The chair itself was draped in black in memorial of Wyn following the announcement of his win and revelation of the author’s actual identity. A Welsh-language film based on Wyn’s life was produced in 1992, Hedd Wynn.